[JAN. 30, 2001] On Monday afternoon, Illini Central’s girls basketball team faced off against Midwest Central. The Lady Cougars were down in the first quarter, but they came back in the second quarter and stayed ahead of Midwest for the rest of the game. Illini Central won 65-54. Winkleman led Illini Central’s team with eight field goals, five free throws and 21 points. Oney and Damm were also assets to their team, scoring 15 points each. Oney shot two of the team’s four 3-pointers, plus four field goals and one free throw. Damm made one of the team’s 3-pointers, along with three field goals and six free throws. Harvey scored six points with her two field goals and two free throws. Francis made one field goal and two free throws to earn four points. Montgomery shot the team’s remaining 3-pointer, and Sh. Blackstock made one point. Altogether, the Lady Cougars made four 3-pointers, 18 field goals and 17 free throws. Midwest made four 3-pointers as well, but only 17 field goals and eight free throws. [JAN. 30, 2001] Yesterday, Hartsburg-Emden’s junior high volleyball team played an away match against Tremont. Hartem brought back two victories. The seventh grade team beat Tremont 15-4 and 15-13. The eighth grade team defeated Tremont 15-9 and 15-8. [JAN. 29, 2001] When the Lincoln Gator Swim Club participated in the 2001 Mid Winter Classic at Champaign on Jan. 27 and 28, two swimmers on the team turned in new A times. Brennan Elsas achieved two new A times: one in the 25-yard freestyle, with a time of 16.70, and another in the 50-yard backstroke, with a time of 43.80. Brennan has now achieved A times in three different events. Sam Wood also achieved some new A times this weekend. He has earned four A times so far. His new ones are in the 25-yard free, with a time of 16.87; in the 25-yard fly, with a time of 19.36; and in the 50-yard backstroke, with a new team record time of 42.58. Sam also broke his own 100 IM record by three seconds with a time of 1:38.94. Other results for Gator swimmers among the top 10 finishers are listed below. [JAN. 29, 2001] This weekend Lincoln Community High School’s boys basketball team competed against Springfield in an away match. The Railsplitters beat Springfield 67-52. 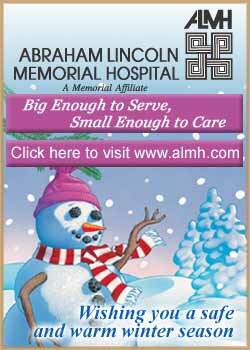 Alexander, with 23, made seven field goals and nine free throws to earn a third of Lincoln’s points. Tungate aided the team with seven field goals, two free throws and 16 points. Williams scored the team’s one 3-pointer plus three field goals and three free throws, to equal 12 points. The rest of the individual statistics were as follows: Schonauer 4-0-8, Ashley 2-0-4, Komnick 1-0-2 and Schrader 1-0-2. The Railsplitters shot one 3-pointer, 25 field goals and 14 free throws. Springfield made seven 3-pointers, 12 field goals and seven free throws. [JAN. 29, 2001] Hartsburg-Emden traveled to Tremont this weekend to compete in a boys’ basketball game. Tremont won 60-42. Aper led Hartem’s team with two 3-pointers, two field goals, four free throws and 14 points. Gleason also scored a 3-pointer for the Stags, along with two field goals and two free throws, for a total of nine points. Wrage made nine points as well. He shot three field goals and three free throws. Ke. Leesman made three field goals and two free throws for eight of Hartem’s points. Jones scored two points for the Stags. Altogether Hartsburg-Emden made three 3-pointers, 11 field goals and 11 free throws. Tremont shot a total of two 3-pointers, 23 field goals and eight free throws. 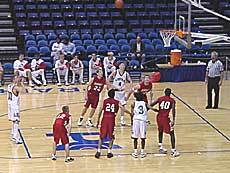 [JAN. 29, 2001] Both of Olympia High School’s basketball teams competed this weekend. The girls traveled to Normal to play against University High. The boys played at home against Bartonville Limestone. The Lady Spartans lost to U-High 56-40. Oly’s five 3-pointers were made by Gaither and Floyd. Gaither shot four 3-pointers, one field goal and three free throws to earn 17 points for the Lady Spartans. Floyd scored seven points for Olympia with her 3-pointer, field goal and two free throws. The rest of the individual statistics were as follows: Doornbos 2-1-5, Gale 2-0-4, Litwiller 1-0-2, Prager 1-0-2, Short 1-0-2 and Lubbert 0-1-1. Altogether, the Lady Spartans made five 3-pointers, nine field goals, and seven free throws. University High made a total of 22 field goals and 12 free throws. Limestone more than doubled Olympia’s final score, 55-23. Kendrick was the top scorer for the Spartans. His six points came from two 3-pointers. Wise shot two field goals, or four points. Holliger and Sherman each made one 3-pointer for Oly’s team. The rest of the individual statistics were as follows: Holliger 1-0-3, Sherman 1-0-3, Wright 1-0-2, Bode 1-0-2, Lee 0-2-2, Olson 0-1-1. As a team, the Spartans made four 3-pointers, four field goals and three free throws. Limestone scored six 3-pointers, 13 field goals and 11 free throws. 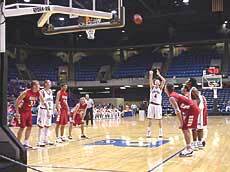 [JAN. 29, 2001] Lincoln College’s basketball teams competed in Springfield on Saturday against the Lincoln Land Loggers and brought home two victories. The Lady Lynx beat the Lady Loggers 92-81. The Lynx solidly beat the Loggers 79-53. At the end of the first half, the Lady Lynx were behind the Lady Loggers by one point, 44-43, but they worked hard to stay ahead of Lincoln Land in the second half. Four of the Lady Lynx really stood out in Saturday’s game: Ronni Beebe, Christine Lott, Tameeka Dawson and Tiffany Thomas. Beebe shot four field goals and 11 free throws to earn her 19 points. Lott’s nine field goals gave her 18 points. Dawson scored 17 points with seven field goals and three free throws. Thomas made the team’s two 3-pointers plus three field goals and two free throws, to equal 14 points. The rest of the individual statistics were as follows: Sarah McLaughlin 3-2-8, Tammy Bausley 3-1-7, Jesse Dullard 3-0-6, Candace Sheley 1-0-2 and Shaquia Humphrey 0-1-1. Altogether, the Lady Lynx scored two 3-pointers, 33 field goals, 20 free throws and 92 points. The Lady Loggers shot four 3-pointers, 22 field goals, 25 free throws and 81 points. In the men’s game, Lincoln’s Lynx led in the first half and only increased their lead in the second half. Brian Moffit and Eric Crockrell each scored 14 points for their team — Moffit with seven field goals and Crockrell with six field goals and two free throws. The next highest scorers were Creston Coleman and Jay Bates, each with 12 points. Coleman shot five field goals and two free throws. Bates scored four field goals and four free throws. Marlon Brooks made two of Lincoln College’s four 3-pointers plus two field goals and one free throw, to equal 11 points. Gene Reed shot the other two 3-pointers for the team, along with two field goals, and earned 10 points for the Lynx. Michael Sams and Brian Thorsen each made three points for their team. Lincoln College’s men’s team scored a total of four 3-pointers, 28 field goals, 11 free throws and 79 points. Their record is now 16-4, and they are ranked eighth in the nation. Lincoln Land’s men’s team made three 3-pointers, 16 field goals, 12 free throws and 53 points. For their next games, the Lynx and Lady Lynx are scheduled to compete against Spoon River’s teams on Wednesday, Jan. 31, here in Lincoln. 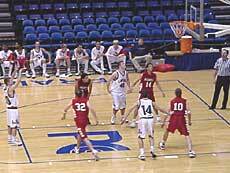 [JAN. 29, 2001] The basketball tournament hosted by Lincoln Christian College is over. The participating teams included one that was not listed in Saturday’s posting about the tournament: North Central. On Saturday afternoon, Lincoln Christian’s Preachers and Angels each played a game. The ladies competed against Cincinnati Bible College. The men played North Central. Lincoln’s Angels got ahead of Cincinnati and led the whole game. The final score was 54-39. Lincoln’s Robbins scored half of her team’s points and all six of the team’s 3-pointers. In addition, she made three field goals and one free throw, for a total of 25 points. O’Malley was the next highest scorer, with 10 points. O’Malley made four field goals and two free throws. Wertin helped the team with three field goals and one free throw, or seven points. The rest of the individual statistics were as follows: Flaherty 2-0-4, Jewell 2-0-4, Szostek 1-0-2 and Vownen 1-0-2. As a team, the Angels shot six 3-pointers, 16 field goals, four free throws and 54 points. Cincinnati’s ladies made a total of four 3-pointers, 10 field goals, seven free throws and 39 points. The men’s teams from LCC and North Central ended the first half of their game with Lincoln Christian ahead by two points. In the second half, the Preachers tied and surpassed North Central’s team to end the game at 92-87. Once again, Matt Clark was a key player for the Preachers, scoring a third of the team’s points. Clark made four 3-pointers, six field goals and 10 free throws, to equal 34 points. Antoni Okusami, Donnie Bowman and Dante Watson were also important contributors in Saturday’s game. Okusami made six field goals and five free throws to earn 17 points for Lincoln. Bowman shot five field goals and four free throws, or 14 points. Watson scored 13 points with his five field goals and three free throws. Jim Turney helped his team by earning nine points with one 3-pointer, one field goal and four free throws. Josh Weber made four points and Jake Raymer made one point for Lincoln. Altogether, the Preachers shot five 3-pointers, 25 field goals, 27 free throws and 92 points. North Central made 11 3-pointers, 16 field goals, 22 free throws and 87 points. University High traveled to Olympia yesterday afternoon to compete in a basketball game and beat Olympia 75-40. Kendrick, Lee, Holliger and Hayes each made a 3-pointer for the Spartans. Lee scored the most points for Oly in yesterday’s game: 11. Besides his 3-pointer, he also made three field goals and two free throws. Wise and Holliger made the second highest number of points for Olympia’s team. Wise shot two field goals, three free throws and seven points. Holliger shot two field goals in addition to his 3-pointer, to equal seven points. The rest of the individual statistics were as follows: Kendrick 2-0-5, Olson 2-1-5, Hayes 1-0-3 and Bode 1-0-2. As a team, the Spartans shot four 3-pointers, 11 field goals and six free throws. U-High made a total of 11 3-pointers, 16 field goals and 10 free throws. The sophomore teams for Olympia and University High played a close game, but the final score still went to U-High, 60-54. Illini Central beat Pleasant Plains in an away game yesterday afternoon, 61-57. The Cougars played a balanced game, with each player participating equally. Miller made six field goals, four free throws and 16 points. Hankins shot four field goals, seven free throws and 15 points. Fletcher and Grimsley each made 11 points. Fletcher scored three field goals and five free throws. Grimsley made five field goals and one free throw. Arnold shot the team’s one 3-pointer, another field goal and one free throw, to equal six points. Deters made two points for the Cougars. Altogether, the team made one 3-pointer, 20 field goals and 18 free throws. Pleasant Plains scored five 3-pointers, 14 field goals and 14 free throws. Hartsburg-Emden played an away match in Greenview yesterday. Unfortunately, the Stags lost the basketball game to Greenview, 61-39. Gleason was the Stags' top player in yesterday’s game. He made three 3-pointers, two field goals and one free throw, or 14 points. In addition to Gleason’s three 3-pointers, Behrends shot another 3-pointer. The rest of the individual statistics were as follows: Anderson 3-0-6, Wrage 2-1-5, Aper 2-0-4, K. Leesman 0-4-4, Behrends 1-0-3, L. Jones 1-1-3. The Stags scored four 3-pointers, 10 field goals, seven free throws and 39 points. Greenview made three 3-pointers, 21 field goals, 10 free throws and 61 points. [JAN. 27, 2001] This weekend Lincoln Christian College is hosting a basketball tournament for both men’s and women’s teams. Kentucky Christian College, Cincinnati Bible College and Central Bible College are here to compete against Lincoln and each other. Last night, Lincoln played two games. The Angels lost to Kentucky 75-44. The Preachers lost to Central 83-70. Kentucky Christian College started the game ahead and never let up. As a team, Kentucky shot five 3-pointers, 27 field goals, six free throws and 75 points. One of Lincoln’s Angels, Robbins, made all of the team's five 3-pointers as well as three field goals, for a total of 21 points. Jewell shot three field goals and three free throws to equal nine points. Flahderty earned six points with her three field goals. Spiering, Wertin, Urton and O’Malley each made two points for Lincoln. Altogether, the Angels scored five 3-pointers, 13 field goals, three free throws and 44 points. Central Bible College made seven 3-pointers, 24 field goals, 14 free throws and 83 points. Matt Clark scored almost half of the Preacher’s points. Clark made four 3-pointers, six field goals and eight free throws, to equal 32 points. The next highest scorers were Jake Raymer and Dante Watson, each with 12 points. Raymer shot one 3-pointer, two field goals and five free throws. Watson made six field goals. Donnie Bowman scored one 3-pointer, two field goals and one free throw. Jim Turney and Antoni Okusami helped their teams with four points and two points respectively. As a team, the Preachers made six 3-pointers, 19 field goals, 14 free throws and 70 points. The new record for Lincoln’s Preachers is 15 wins and 10 losses. Mount Pulaski High School’s girls basketball team played an away match yesterday afternoon against Williamsville. Williamsville defeated the Lady Hilltoppers 63-27. Mount Pulaski’s team had one 3-pointer, made by Faith. The individual statistics were as follows: Clevenger 4-0-8, Sanders 2-4-8, Faith 2-0-5, Rucks 0-3-3, K. Beckers 1-0-2 and Howe 0-1-1. Altogether, the girls made one 3-pointer, eight field goals and eight free throws. Williamsville shot a total of three 3-pointers, 20 field goals and 14 free throws. The Lady Spartans hosted Normal Community High School’s basketball team in Stanford yesterday. The game went to Normal, 50-41. Olympia’s top player in yesterday’s game was Gaither. She scored one 3-pointer, five field goals and three free throws to equal 16 points. 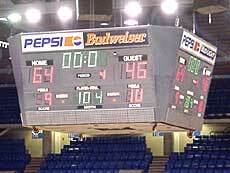 Doornbos was Oly’s second highest scorer, with nine points from four field goals and one free throw. Just behind Doornbod was Bachman. She shot four field goals, or eight points. The remaining individual statistics were as follows: Litwiller 1-1-3, Prager 1-0-2, Gale 1-0-2 and Short 0-1-1. Normal’s girls scored a total of eight 3-pointers, eight field goals, 10 free throws and 50 points. Olympia and Normal’s junior varsity teams competed as well. Normal won again, 48-35. [JAN. 26, 2001] Yesterday afternoon three teams met in Normal for a wrestling competition: University High, Olympia and Prairie Central. The Spartans won both of their matches against the other two teams. The new record for Olympia’s wrestling team is 21 wins and only 3 losses. [JAN. 26, 2001] Parkland College’s men’s and women’s basketball teams came to Lincoln yesterday afternoon to compete against the teams from Lincoln College. The Lincoln men’s victory over Parkland was a sound 71-54. The Lady Lynx lost to Parkland by a small margin, 69-64. Brooks and Bates led the Lynx to victory by scoring 21 and 20 points respectively. Brooks made three 3-pointers, two field goals and eight free throws. Bates made eight field goals and four free throws. Coleman helped his team with five field goals and one free throw, or 11 points. The rest of the individual statistics for the Lynx were as follows: Crockwell 4-0-8, Moffit 2-1-5, Sams 2-0-4 and Reed 1-0-2. Altogether, Lincoln men’s team shot three 3-pointers, 24 field goals, 14 free throws and 71 points. Parkland College’s men scored three 3-pointers, 13 field goals, 19 free throws and 54 points. Lincoln College’s women made six 3-pointers: two by McLaughlin and one each by Bausley, Sheley, Humphrey and Dullard. The top scorers in the Lady Lynx game yesterday afternoon were Dawson with 15 points and Beebe with 14 points. Dawson made seven field goals and one free throw. Beebe made three field goals and eight free throws. Besides her 3-pointer, Sheley shot three field goals, to make nine points. McLaughlin scored eight points with her two 3-pointers and one field goal. The rest of the individual statistics were as follows: Thomas 3-0-6, Bausley 1-0-3, Humphrey 1-0-3, Dullard 1-0-3, Lott 1-0-2 and Story 0-1-1. As a team, the Lady Lynx made six 3-pointers, 18 field goals, 10 free throws and 64 points. Parkland College’s women shot four 3-pointers, 20 field goals, 17 free throws and 69 points. 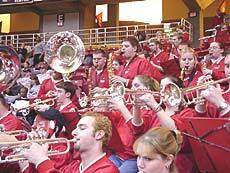 [JAN. 25, 2001] Last night’s contest between Illinois State and Southwest Missouri was a nail-biter, 63-62. At halftime, the Redbirds were up by two points. The Bears earned one point more than Illinois in the second half, but that was not enough to beat the Redbirds or extend the game into overtime. Illinois State beat Southwest Missouri by one point. Tom Richardson, coach of the Redbirds, commented, "They were making better plays down the stretch and probably deserved to win, but they missed a shot. If the game had lasted another minute, they probably would have won. I’m happy with the win, but we have to get better from a defensive standpoint and rebounding standpoint." Tarise Bryson was Illinois State’s high scorer in the game. He made one 3-pointer, five field goals and six free throws, to equal 19 points. Seventeen of Bryson’s points were made during the second half. Shedrick Ford and Cedric Knight were also crucial to the team’s game. Both men scored 12 points by shooting six field goals each. Coach Richardson particularly praised Knight, "Thank God for Cedric Knight, especially in the first half. We really needed him to step up, and he made some important plays tonight." Randy Rice shot three field goals and two free throws during the game to earn eight points for the Redbirds. Shawn Jeppson made five points, Traves Wilson made three points, and Rich Beyers and Dirk Williams each made two points in this game where every single point counted. As a team, Illinois State made two 3-pointers, 24 field goals and nine free throws. Southwest Missouri shot four 3-pointers, 22 field goals and six free throws. This game was the 12th win for the Redbirds in the last 14 games. 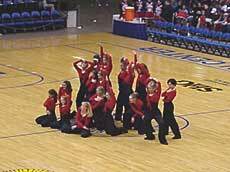 [JAN. 25, 2001] Yesterday in Mason City, Illini Central’s Lady Cougars beat Springfield Lutheran in a basketball game. The final score was 50-37. IC's leading scorer, by far, was Winkelman. She shot 13 field goals and one free throw. The rest of the individual statistics were as follows: Harvey 3-0-6, Damm 1-3-5, Blackstock 2-0-4, Oney 1-0-3, Montgomery 1-0-2, Bitner 1-0-2 and Francis 0-1-1. Altogether the team made one 3-pointer, 21 field goals and five free throws. Springfield Lutheran’s team scored 14 field goals and nine free throws. The two junior varsity teams faced off as well. Illini Central barely beat Springfield, 31-29. [JAN. 25, 2001] Lincoln College’s men’s basketball team went to Danville yesterday to compete against their school’s basketball team. Lincoln was ahead at halftime 33-23. In the second half, Danville rallied and scored seven more points than Lincoln, but that was not enough to overturn Lincoln’s previous lead. Lincoln won 63-60. Marlon Brooks led the Lynx. He made three 3-pointers, five field goals and five free throws, to equal 24 points. Creston Coleman and Jay Bates were also assets to Lincoln’s team. Coleman scored 13 points with five field goals and three free throws. Bates shot three field goals and six free throws. Michael Sams, Brian Moffitt and Eric Crockrell each made four points for the Lynx. Ryan Brinker shot two points. As a team, Lincoln College scored three 3-pointers, 20 field goals and 14 free throws. Danville scored two 3-pointers, 21 field goals and 16 free throws. 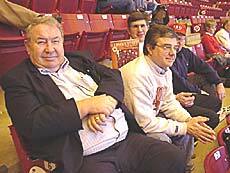 [JAN. 25, 2001] Marantha Baptist came to Lincoln on Tuesday night to compete against Lincoln Christian College’s Preachers. Lincoln was behind in the first half but came back in the second half. Unfortunately, the Preachers’ revival was not strong enough, and Marantha Baptist won 75-70. Lincoln’s leading scorer was Matt Clark, making almost half of the team’s points. Clark shot two 3-pointers, 10 field goals and five free throws to equal 31 points. Antoni Okusami earned 14 points with six field goals and two free throws. Jim Turney made two 3-pointers, two field goals and two free throws, or 12 points. Donnie Bowman scored nine points via four field goals and one free throw. Dante Watson helped the team with four points. As a team, the Preachers scored four 3-pointers, 24 field goals and 10 free throws. Marantha Baptist made 11 treys, 14 field goals and 14 free throws. 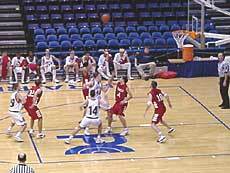 [JAN. 24, 2001] The biggest thing that Lincoln Railer coach Neil Alexander wanted to accomplish on Tuesday night was to get his team a game and some experience on the PCCC floor. Things would have to fall right for his cagers, but he fully intends to win the regional whether it’s played in the friendly confines of Roy S. Anderson gymnasium or if they have to go and capture it on the road. He was even willing to give up a home game and maybe take a small hit at the gate to make it happen. Alexander was rewarded with all that AND a convincing 64-46 win over the Jacksonville Crimsons. While Alexander continues to be wowed by the PCCC facilities, the Railers’ offensive prowess has left him underwhelmed. However, if it’s true that championships are won on defense, then the blanket the Railers threw on the Crimsons in the second half is an encouraging sign of what’s to come. They held the Crimsons to only 35 percent shooting on 16–of-45 from the field. Keep in mind that Jacksonville was coming off an electrifying 61-52 upset of Quincy this past Saturday…at Quincy! They were in the throes of a drought with the Blue Devils that had covered 13 years and 15-straight games. In fact, I think the record will show that the last time Jacksonville beat Quincy, Andy Kaufmann was manning the paint for the Crimsons. But just to show you how effective the Railers’ defensive scheme was for the night, examine the case of Chevus Jackson. Jackson, who is probably a consensus all-Central State Eight performer, erupted for 24 points in the amazing win at Quincy. The Railers must be scouting geniuses because they seemed to find Jackson everywhere he went…at least in the second half. They limited him to only 13 points and by doing so took him and the rest of the team out of their game. In fact, the Railers had Jacksonville so discombobulated that they forced the Crimsons into 27 turnovers for the game. Some of the Railer offensive struggles may be evaporating. Last night Lincoln demonstrated outstanding balanced scoring by getting 20 points from Gregg Alexander, 12 from J.T. Ashley and 11 from Chad Tungate. They also hit for 51 percent of their shots, even though nary a 3-pointer was made…and they were 11-of-15 from the line. The Railers outscored the Crimsons in every quarter and just seemed to have the visitors befuddled at every turn. After the game, coach Alexander said his goal was for the team to strive to keep getting better. He added that perfection is impossible to attain, but you must always strive for it. There was no last-second miracle finish in store for Jacksonville on this night…it was all Lincoln! Illini Central trounced Ursuline 97-56 at Mason City. Quarter scores: 19-14, 44-23, 72-37, 97-56. Leading the game for IC in high points were Miller 18, Deters 17 and Arnold 17 points. Three-point field goals for IC were scored by Fletcher 2, Mulford and Giesler. Illini Central team stats: Miller 8-2-18, Hankins 5-3-13, Fletcher 5-2-14, Mulford 1-0-3, Herman 0-1-1, Giesler 3-2-9, Scott 1-1-3, Arnold 5-5-17, Deters 7-3-17, Ju. Deters 0-2-2, Grimsley and Cunningham; totaling 36 field goals, 21 free throws, for 97 points. The Hilltoppers played blood, sweat and tears against Midwest Central on their home court. Down by 16 (9-25) in the first quarter, Mount Pulaski picked up 17 points to make it 26-40 at halftime. With a big push, they were 43-54 by the end of the third quarter. Continuing on, they were tied with Midwest Central at 66 at the end of the fourth quarter. The Hilltoppers lost by a mere four points, 76-80, in overtime. Leading the game for Mount Pulaski as high scorers were Brown with 28 and Anderson with 13 points. Seven 3-point field goals for the Hilltoppers were scored by Anderson (4), Davis, Clark and Wilson. Mount Pulaski team stats: Brown 10-8-28, Davis 3-0-7, Blaum 0-1-1, Clark 3-0-7, Schilling 2-0-4, Smith 1-0-2, Wilson 3-2-9, Anderson, 6-2-18; totaling 28 field goals, 13 free throws, for 76 points. Lincoln topped Jacksonville 64-46 at Springfield Tuesday night. Quarter scores (Lincoln first): 15-10, 27-20, 36-28, 64-46. Leading the game for Lincoln in high points were Alexander with 20 and Ashley with 12. Lincoln team stats: Williams 3-2-8, Alexander 7-6-20, Komnick 1-0-2, Tungate 3-5-11, Knopp 0-2-2, Aper 0-1-1, Ashley 4-4-12, Schonauer 2-0-4, Welch 1-2-4 and Schrader; totaling 21 field goals, 22 free throws, for 64 points. For pictures and a game report from Jeff Mayfield, click here. The Lady Railers played Normal Community at home Tuesday night. Lincoln won 50-40. Starting out slow, the Lady Railers turned the game around at halftime, passing up Normal by the end of the third quarter. Quarter scores (Lincoln first): 5-12, 18-20, 32-26, 50-40. Leading the game for Lincoln in high points: Ingram 12, with two 3-point field goals and three 2-point field goals; Oller 10, with two field goals and six free throws; and Cook 9, with two field goals and five free throws. Lincoln team stats: Humbert 4-0-8, Whalen 0-3-3, Ingram 5-0-12, Cook 2-5-9, Bunch 2-0-4, Oller 2-6-10, Johnson 0-2-2, Freschauer 1-0-2; totaling 16 field goals, 16 free throws, for 50 points. The Lady Hilltoppers played a tight game with the Athens girls at Athens. With quarter- ending scores always within one or two points, Mount Pulaski held the lead through the third quarter, but Athens slipped past them in the fourth, 46-44. Quarter scores: 16-14, 21-20, 32-30, 44-46. Clevenger led the Lady Hilltoppers with 22 points. She had five 3-point field goals, one 2-point field goal and five free throws. Faith also made two 3-point field goals for Mount Pulaski. Mount Pulaski stats: Faith 3-0-8, Clevenger 6-5-22, Jason 2-0-4, K. Beckers 1-0-2, Sanders 3-2-8, Rucks, Howe; totaling 15 field goals, 7 free throws, for 44 points. [JAN. 24, 2001] Olympia High School's wrestling team defeated Illini Bluffs and Canton at Stanford. Results follow. [JAN. 23, 2001] Mount Pulaski’s High School girls basketball team faced off against Riverton yesterday afternoon in Riverton. Riverton was the winner, without question. The final score was 63-23. Clevenger and Sanders were the high scorers, with nine and eight points respectively. K. Beckers, Rucks and Cyrulik each made two points. Altogether, Mount Pulaski shot nine field goals and five free throws. Riverton scored five 3-pointers, 15 field goals and 18 free throws. [JAN. 23, 2001] Olympia’s Lady Spartans traveled to Decatur yesterday to compete against Decatur Eisenhower’s basketball team. Olympia returned home victorious, 39-30. Prager made Olympia’s one 3-pointer. Gale was the top scorer, with five field goals, or 10 points. The rest of the individual statistics were as follows: Short 3-0-6, Goebel 1-4-6, Fraher 1-3-5, Bachman 2-0-4, Gaither 0-3-3 and Coit 1-0-2. Altogether the team made one 3-pointer, 13 field goals, 10 free throws and 39 points. Decatur Eisenhower shot 12 field goals, six free throws and 30 points. The junior varsity teams faced off as well. The final score of the game was Olympia 57, Decatur Eisenhower 18.